Refurbishment - POS Plus, Inc. Unlike most refurbishers, POS Plus gets involved. We pride ourselves on the commitment to quality that we apply to every order we receive. From easy-open shipping containers to our thorough refurbishment process, it’s our attention to detail and our ability to meet each customer’s needs individually that sets us apart in the marketplace. Our customers notice this difference because the businesses we serve come back to POS Plus over and over again. All components are disassembled and thuroughly cleaned. We’ll repair or replace componenets as needed, and repaint covers if necessary to ensure a like-new appearance. 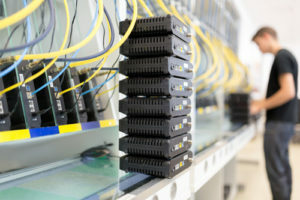 Machines are assembled to the customer’s configuration, with memory installed and the correct cables connected. All machines are tested for display brightness, keyboard operation and printer quality. Any components that fail these tests are repaired or replaced, then tested again. Machines are packed for shipping in custom-fitted boxes. The machine type, model number and serial number are printed on the box exterior for easy reference.